Have you ever heard someone refer to a lobster as a "chicken"? What about a "cull" or a "sleeper"? These are all words used to describe different lobsters and you'll want to bone up on your lobster lingo so you know what to expect. A key to selecting the best lobster is to understand what certain terms mean. Some of these refer to delicacies you can find within the lobster while others are useful in determining the quality of the lobster itself. Tomalley: The liver of the lobster. It is greenish in color and prized for its flavor. It is often added to sauces to boost the lobster flavor. Coral: Deep red when raw and coral pink in color when cooked, this is the roe or egg sac found only in the female. They are considered a delicacy and are also often added to sauces. Chicken: These are small lobsters popular in New England, ranging in weight from one to two pounds. The name allegedly refers to their tenderness. Paquette: A French term for a female lobster with fully formed eggs. The lobster is deemed most succulent at this stage and commands a high price. Pistol: A lobster that has lost its claws, usually due to predators. Luckily, lobsters regenerate their claws. Cull: A lobster that has lost one of its claws. These are used when the presentation of the full lobster is not a factor. They are usually less expensive but perfectly fine for all but the fanciest dinner party where looks count. Sleeper: Term for a lobster that is so sluggish it cannot hold up its claws. These have been out of their environment too long and are usually close to death. They should be avoided. Soft-shell: Like crabs, lobsters molt their shell. Unlike crabs, they are not a good choice, although they are certainly edible. 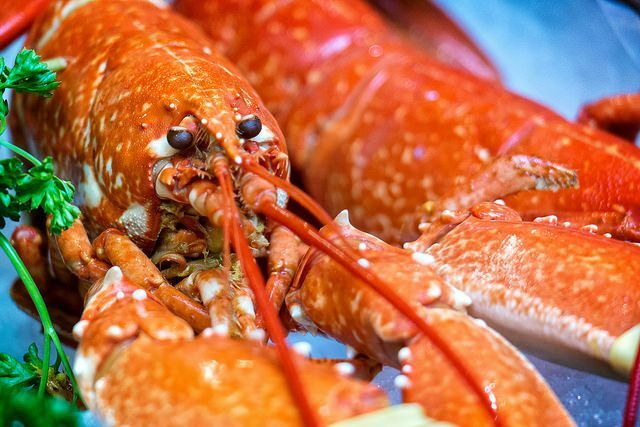 Soft-shell lobsters feel lighter and will rattle when shaken. The shell color is also usually much redder than usual. They have less meat and are not necessarily flavorful, so the connoisseur usually avoids them. Lobster shack: New England, particularly Maine, is awash with these roadside restaurants. They specialize in freshly cooked lobsters with very little embellishment. Shorts on: A term used in the industry to indicate a lobsterman who has caught lobsters under or above the legal size limit. Eighth: A lobster weighing 1 1/8 pounds. Quarter: A lobster weighing 1 1/4 pounds. Large: A lobster weighing 1 1/2 to 2 1/2 pounds. Jumbo: A lobster weighing over 2 1/2 pounds.